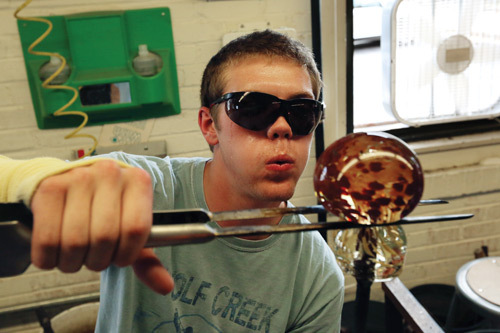 Science and art intersect in the Hot Glass Shop, where students have used their scientific minds to drive their creativity since the facility opened on the Missouri S&T campus in 2007. Only 16 students are accepted into the course each semester since the small workspace restricts the number of participants able to work safely in the shop with its one crucible and one reheat furnace. Once they learn the basics of working in the shop, students are turned loose to express themselves by making a variety of objects for practical application or aesthetic appeal. 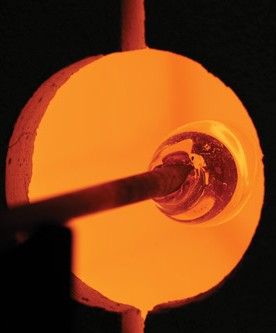 The shop contains a freestanding crucible filled with more than 100 pounds of clear glass at 1,135 degrees Celsius. 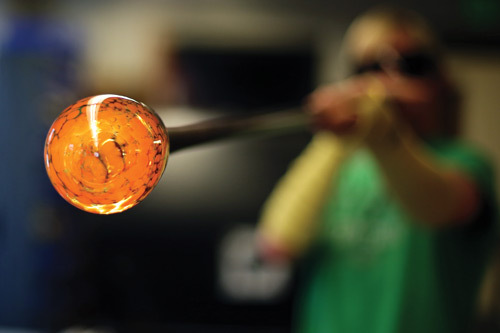 Glass is gathered from the crucible using stainless steel rods (called punties) or hollow blowpipes, then shaped using a variety of tools to pinch, pull and form the glass. 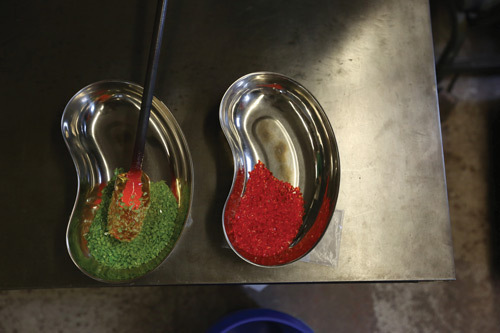 Color is added by fusing colored pieces of crushed glass (called frit) to the hot globules, which are then manipulated to create swirls of color or left alone to speckle the glass. 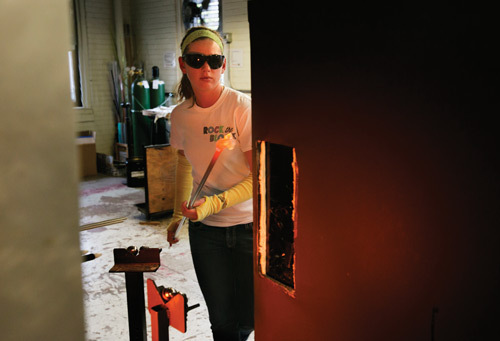 Mallory Purnell, a sophomore in ceramic engineering, removes her punty with molten glass from the glory hole before returning to the work bench to shape her piece. 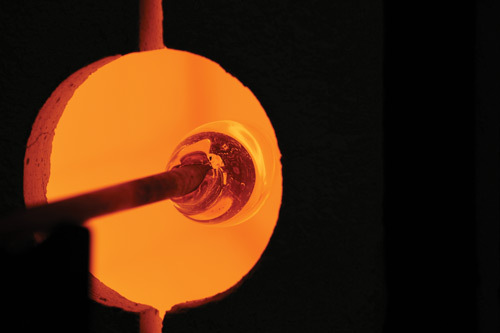 The reheat furnace, know as a glory hole, reaches temperatures around 1,250 degrees Celsius to keep the glass malleable during the process. 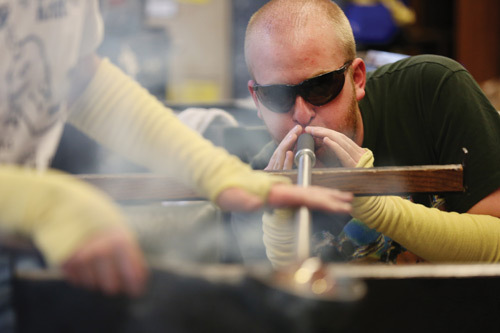 A senior in mining engineering, Martin Langenderfer carefully blows into the pipe as it rolls across the bench to keep the glass symmetrical when manipulated with a shaping tool. 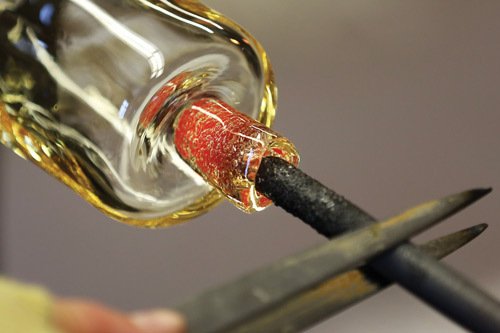 glass on its tip is fused with the bottom of a handmade container. 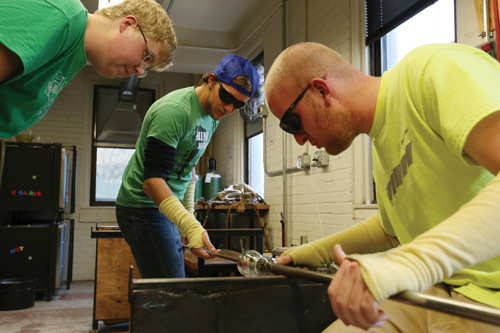 Austin Gerlt, a senior in ceramic engineering (left), and Martin Langenderfer, a senior in mining engineering (right), work together in the shop to create an open container with clear glass. Evin Barber, a sophomore in ceramic engineering, cools down a glass paperweight while using jacks to create a line for the glass to separate from the solid stainless steel rod, known as a punty. 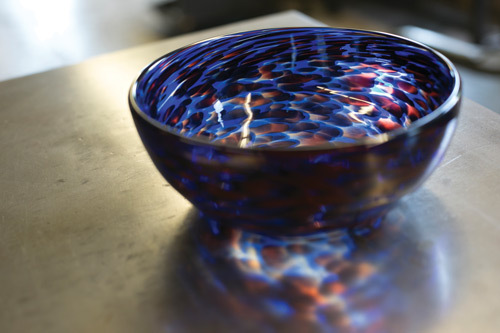 Students are asked to donate some of their finished pieces, like the bowl pictured above, back to the materials science and engineering department to be sold in McNutt Hall. The proceeds help fund future Hot Glass Shop projects.